Overclocking has generally been the domain of enthusiasts with desktop rigs. Though more recently we have seen even SFF PCs joining the bandwagon – Intel's Hades Canyon NUC, for example, supports overclocking the CPU as well as the GPU. However, increasing the CPU frequency beyond the official specifications is not the only way to extract more performance from a computing system. Memory-bound workloads can benefit from memory hierarchies with increased bandwidth and/or lower latencies. We last looked at DDR4 memory scaling effects on SFF PCs when we experimented with different SO-DIMMs in the Skull Canyon NUC (NUC6i7KYK) based on the Skylake platform. Current SFF PCs are based on Coffee Lake, which brings in more cores while keeping power efficiency in mind. Compared to the Skylake memory controller's official limit of 2133 MT/s, the Coffee Lake memory controller ships with DDR4-2666 supported out of the box. In this article, we explore the effects of varying DDR4 SO-DIMM frequencies and timings on a SFF PC with a standard Coffee Lake desktop CPU. Since the introduction of DDR4 support in the Skylake platform, we have seen expanded support for overclocked memory kits on both the desktop and notebook segments. On standard non-overclocked systems, the DDR4 memory controller in Coffee Lake desktop CPUs operates at 2666 MT/s, while the U-series CPUs have a 2400 MT/s interface. DDR4 DIMMs operating as high as 4266 MT/s are available for desktop systems with full-sized memory slots. On the SO-DIMM side, we have seen various vendors introduce kits operating between 2133 MT/s and 3200 MT/s. While 2400 MT/s has become the de-facto SO-DIMM frequency for current systems, the usage of desktop CPUs in SFF PCs such as the ASRock DeskMini have ensured that the higher frequency SO-DIMMs also have adoption. At the time of our Skull Canyon NUC memory scaling experiments, the number of SFF PCs supporting overclocked SO-DIMMs was very few. Since then, we have had numerous SFF systems utilizing desktop CPUs go through our test bench – the Zotac ZBOX MAGNUS EN1080K and the ASRock DeskMini GTX bring prime examples. For today's article we chose the latter for our experiments; the BIOS includes XMP support, making it very easy to get the SO-DIMM kits running at their higher-rated frequencies. With memory prices still running quite high, we shifted from the 2x16GB configurations used in our Skull Canyon memory scaling piece to 2x8GB configuration for the Coffee Lake experiments. 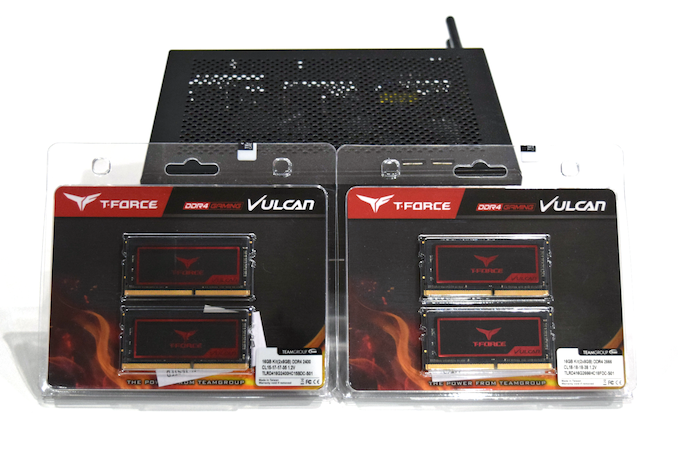 To this end, we procured some of Team Group's T-Force Vulcan SO-DIMMs, which are available in both 2400 MT/s and 2666 MT/s speed grades. 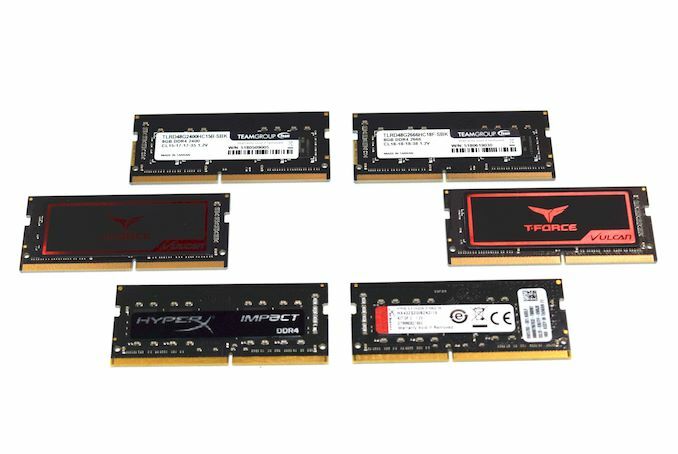 Meanwhile to look at higher memory speeds, we also picked up one of Kingston's HyperX Impact 3200 kits. The rest of this review deals with the quantitative measurement of the effectiveness of different types of DRAM in the ASRock DeskMini GTX (Z370). In order to do this, we processed various benchmarks while keeping everything other than the DRAM SO-DIMMs constant. Each configuration was booted to BIOS multiple times to ensure that the SPD information was properly parsed and the optimal frequency / timing parameters chosen. Once the OS was booted, we also checked with multiple hardware monitoring tools that the parameters indicated by the BIOS for the DRAM SO-DIMMs were indeed what the OS was also seeing. In the next section, we will first take a look at the specifications of the three SO-DIMM kits / four configurations that were evaluated in the ASRock DeskMini GTX Z370, along with the AIDA64 Memory Bench for each. Following this, we present the results from our updated test suite for SFF PCs and workstations - SYSmark 2018, Futuremark / UL benchmarks, SPECworkstation 3 etc. Prior to our concluding remarks, we take a look at a few miscellaneous aspects such as pricing. "No, not really. The slowest and faster RAM here aren't that far off." There is a difference in two memory heavy applications. The RAM drive shows a ~20% benefit and one of the image processing benchmarks shows ~10% benefit. Not sure what other games it applies to but in Overwatch the RAM speed actually has a pretty significant impact on FPS when you start going very high FPS.